The insulation fault locators EDS460/490 in combination with the ISOMETER® IRDH575 or the locating current injector PGH are applied for localising insulation faults in unearthed systems (IT systems). The locating current signals generated by the insulation monitoring device IRDH575 or the locating current injector PGH are detected by measuring current transformers and evaluated by the insulation fault locators. 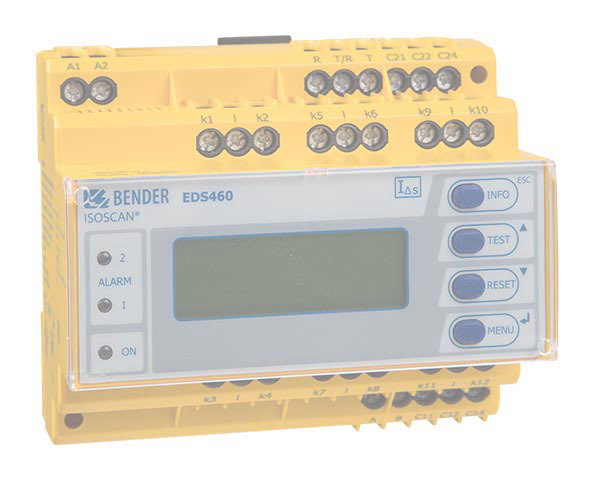 Up to 12 measuring current transformers can be connected to one EDS460/490. A total of 90 EDS insulation fault locators can be connected via one RS-485 interface (BMS protocol). Hence, up to 1080 circuits can be monitored. The maximum scanning time is 10 s, see TGH1394.